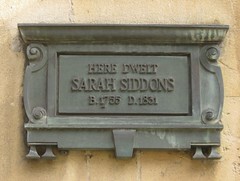 Sarah Siddons (5 July 1755 – 8 June 1831) was a Welsh-born actress, the best-known tragedienne of the 18th century. She was the elder sister of John Philip Kemble, Charles Kemble, Stephen Kemble, Ann Hatton and Elizabeth Whitlock, and the aunt of Fanny Kemble. She was most famous for her portrayal of the Shakespearean character, Lady Macbeth, a character she made her own, and for famously fainting at the sight of the Elgin Marbles in London. The Sarah Siddons Society continues to present the Sarah Siddons Award in Chicago every year to a prominent actress. This building, erected in 1750, was formerly the Theatre Royal managed by the celebrated John Palmer MP, originator of the mail coach system and holder of the first Royal Patent ever granted to a provincial theatre, to its stock company, for a period of four years (1778-82) belonged the renowned Sarah Siddons, with her husband and sister. Here also appeared her brothers, John Philip Kemble and Stephen Kemble. Here John Henderson and R. W. Elliston both made their first appearances on the stage and were for a long time leading actors. Samuel Foote, George Frederick Cooke, William Dimond, Benjamin Engledon, George and Mrs. Bartley, and many other famous players also acted in this theatre, which was closed in 1805.